As indicated by the name, the Alberta Arts District revolves around bustling Alberta street, stretching through North and Northeast Portland and boasting some of the Portlandiest (if you will) cultural destinations in the city. Want to take a sewing class or pick up some are supplies to follow the latest craft trends? Need to find a midwife? Looking to taste the finest coffee or grub at a sweet vegan café? This is the place. They also have tons of boutiques, secondhand shops, traditional fare and clothes shopping. On the last Thursday of every month, Alberta transforms into an awesome street fair, at which you can find food, music, dancing, crafts, shopping and more. In August, the Alberta Street Fair really brings the thoroughfare to life, giving visitors and residents alike a fun, rowdy cultural hit. 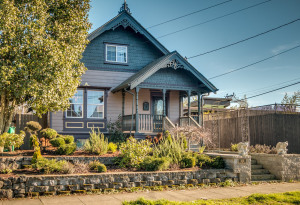 The area contains some of Portland’s nicest homes, many built in the Craftsman style. Although you can also find smaller one- or two-bedroom bungalows, many houses are quite large, with three, four or even five bedrooms and several bathrooms. Square footage tends to be large as well, offering traditional living and dining rooms with classic detailing and lots of original hardwood, in addition to nice perks like adorably updated kitchens, finished basements and beautiful yards. If you’re looking to buy in this area, look forward to the “Keep It Weird” feel that Portland is known for, as well as walkability, excellent dining options, lots of parks and family fun, and beautiful homes.